On May 27, 1794 Empress Catherine || signed a rescript in which she ordered to start the creation of a seaport town on the site of Hajibey. On August 22, 1794 the first stones were laid down in the foundations of two temples and the landmark was fixed for city building. It was this event that became the birtday of the new town. The city was granted a coat -of- arms with the inscription in Russian, Greek, Italian and German. 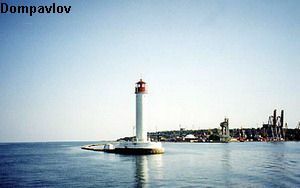 spot of the old fortress Hajibey, now one of the largest Black Sea ports is situated - Odessa Sea Port. In prewar years the large attention was given to magnification of a potency of port. The new berthes were constructed, the load factor processes were mechanized. Within the Second world war the port has undergone to significant destructions. 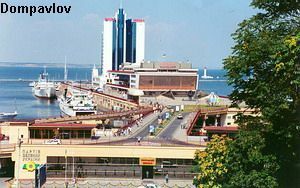 But, due to gains dockers and inhabitants of Odessa, already through some months after release city, it began to function and in rather short times was restored. With disintegration of the Soviet Union, processing was sharply reduced. After crisis of 1993 - 1994 when the structure of the port was changed and joint activity companies were created instead of cargo handling terminals, the cargo handling capacity is continionsly increasing. Cargo handling technology is having been constantly perfectioned, the berths and equipment having been modernized, the spectrum of offered services having been enlarged. The cargo nomenclature was interchanged. The main cargoes transhipped by port are black metal, mineral fertilizers, grain, petroleum.